I loved Under the Never Sky because it was one of the few books that has romance that I actually believed in. The characters did things that made sense, and the world was wonderful. 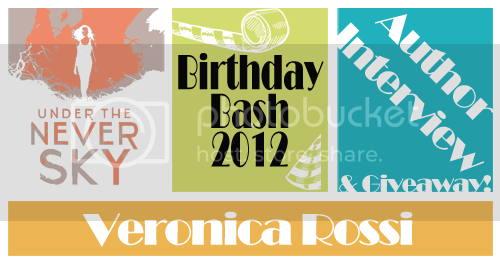 It's because of all of that and more that I am pleased to welcome Veronica Rossi to the bash! Check out my interview with her! In Under the Never Sky there are a lot of things left rather vague (like what exactly the aether is, for instance). Is this something that you did intentionally while you were writing, or did it just happen naturally? I guess the answer is both. I try to leave myself room to explore when I write, and I also knew this would be a trilogy, so I wanted to save some things to dig into more deeply in the later books. How deep did you dig in this book? Specifically, in terms of research. When writing UtNS did you do a lot of research into science and evolution? The way the “savages” have evolved, and the idea of the people inside the pods turning into lunatics just seemed so real and plausible! Did you really just make that all up? That’s very funny. I did do quite a bit of research into genetics before I wrote. I definitely made up the story based on theories I read about, but I agree with you that much of it seems plausible. That was important to me; making it all seem like it could really happen. How do you measure writing accomplishments? Do you set daily word/time goals? Weekly? Is it important for you to write every day? My goals change all the time. Right now I’m working on a few projects in addition to writing the last book in the trilogy. I do try to write every day but if I miss, it’s because I’m working at brainstorming or outlining—or doing marketing related things. I try not to beat myself up too much when I don’t get any writing done. Some days just don’t work out. I do read every day. I never skip that! That's so cool to hear that you read every day even if you don't write every day. I like that answer. Random times: What’s your opinion on spiders? Funny you should ask. I’ve always been an arachnophobe! I can handle snakes and creepy crawlies but spiders freak. Me. Out. I collect anything elephant-related. They’re my favorite animal. I also have a pretty good collection of snow globes that I bring out during the holidays. I love snow globes. They’re perfect little self-contained worlds…rather like the Pods! Your bio mentions a TON of awesome places that you want to visit. If you could only choose ONE, which would you choose and why? Rome, because I love it and have been trying to get back since the day I left. And lastly, a mad-lib! Fun times! As always, credit for this idea goes to the reviewers at Everead. The Outsider brought out a squishy sign from his song and began to tread his ring. Aria watched him from the corner of her eye. His shoulders were pensive and soft. They drew the girl over the fiery surface in even, sure strokes. The arrow hissed a spicy rhythm. 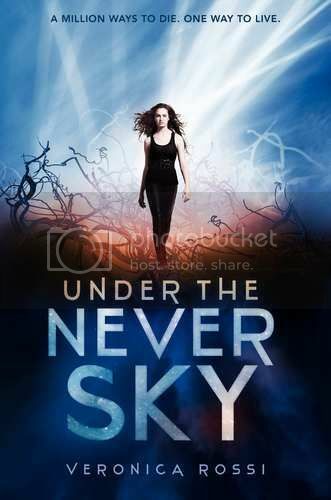 You can win a Signedcopy of Under the Never Sky! Today's giveaway is hosted by Pica Reads. Head on over to win. This giveaway is open TO US ONLY! I <3 elephants. This book looks very good! Looking forward to reading this! Sounds interesting. Veronica sounds like a fun person to know. I loved this book as well and am excited about the next one! Thanks for a great interview -- it's always interesting to read about their writing process as well as fun little tidbits! I so enjoyed this book (for whatever reason, I particularly liked the cannibals), but I think I better keep Ms. Veronica away from my pet tarantula. I'm a huge fan and I can't wait for the next book in the series! Thanks for the great interview! I adored this book. So good! I am the exact same way about spiders. They're nasty! I'm excited to read this! I'm not a spider person either:p Thanks for the interview! I would love to go to Rome one day too! 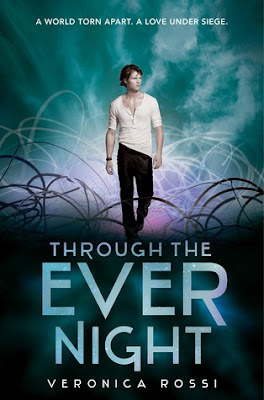 Thanks so much for the awesome interview :), and the cover for Through the Ever Night is just AMAZING! I still haven't read this book! AGH! I can't wait to read it though! aww elephants!! Thats ADORABLE!! haha! I loved this interview! So fun! Thank you so much for sharing with us dear! Great interview! I am the same way i hate spiders but can handle anything else. I've wanted to read this for soooo long!! And now there are two in the series!!! I can't wait to get my hands on a copy! My grandmother was an elephant collector too. She had all kinds of elephants in her house. Great interview! I would love to visit Rome too. Can't wait for Through the Ever Night!! I always wonder if writers still have time to read! Glad to hear they do still read every day! Birthday Bash 2012 Starting Line! Birthday Bash Schedule is Live! Utah Book Month! 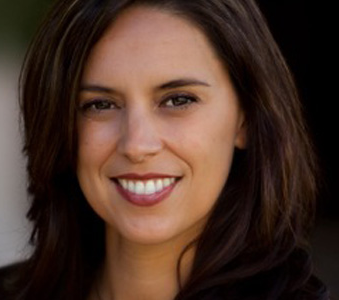 Review a Utah Book!